When is a drink not a drink? When it’s a cocktail, apparently. Edible cocktails are all the rage, but what are they? Basically, they are drinks you can eat or (to use terrifying PR-speak) beverages that “distort the boundaries of food and drink”. From “cuptails”, to jelly shots, nitro meringues to dollops of boozy ice-cream floating in your fizz, cocktails are being reworked in new, munchable ways. The trend gives a nod to the US, where legendary bars such as the Aviary in Chicago have long been knocking up molecular marvels: giant spheres of ice you have to crack open to get to an old fashioned inside, or gels made of Peychaud’s bitters placed over a “deconstructed Moscow mule”. Now it seems to be catching on in Britain. Pollen Street Social has a lot of fun with popcorn, while the Angel Share Bar in Edinburgh serves its guests jelly-cubed cosmopolitans, made by stirring the cocktail into four leaves of dissolved gelatin and freezing for two days. As the bartender tells me: “It’s a little bit sucky, a little bit chewy and it allows the flavours to linger in your mouth for longer.” Here are five other interesting cocktails to chew over. Edible G&T meringues by Eddie Shepherd. Meringue-topped cocktails are gracing cocktail menus all over the UK – the Alchemist does an entire line based on childhood desserts – but Eddie Shepherd’s extremely light G&T meringues are an aromatic delight, scented with juniper and lime, which waft in on dry-ice mist. 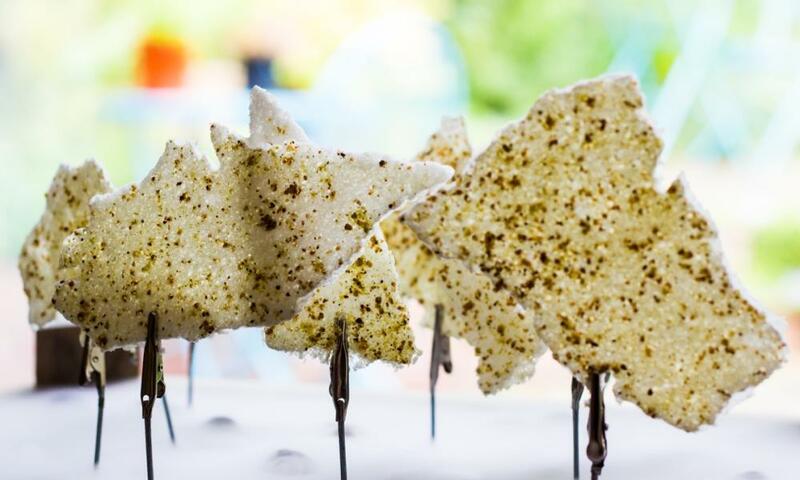 Basically, it’s a strongly flavoured gin and tonic – sweetened with juniper syrup and finished with fresh lime juice – whipped up into a super-light meringue (with no egg), then dried and dusted with cucumber sugar and crushed juniper berries. For other boozy creations, check out Shepherd’s book The Edible Cocktail. OK, so, basically this is a long, slurpy drink with a bit of sushi plonked on top, but, oh my, it’s so much more than that. Hot, fiery and cooling all at the same time, the Tom Yam is a banger of a tipple – those chillis really make your eyes water. Created by bartender Richard Woods along with the execute chef Cláudio Cardoso (the Duck and Waffle is there, too), the drink recreates the fiery flavours of tom yam soup into cocktail form – coriander-infused vodka, red chilli slices, ginger, kaffir, lime leaves served with a shiso-leaf-wrapped turbot nigiri. It sounds like it shouldn’t work, but it does. Surreal … lips cocktails from Fraiche. Edible cocktails are big on theatrics and nowhere is this more true than with Michelin-starred chef Marc Wilkinson’s creations, such as his bright-red mouth on a stick, which is big and blousy in a Bet Lynch kind of way. Wilkinson was inspired after a visit to the Dalí Museum in Figueres and brings his love of the surreal to the table, where customers can transform the virgin mary into a bloody mary with just a spritz of vodka spray. 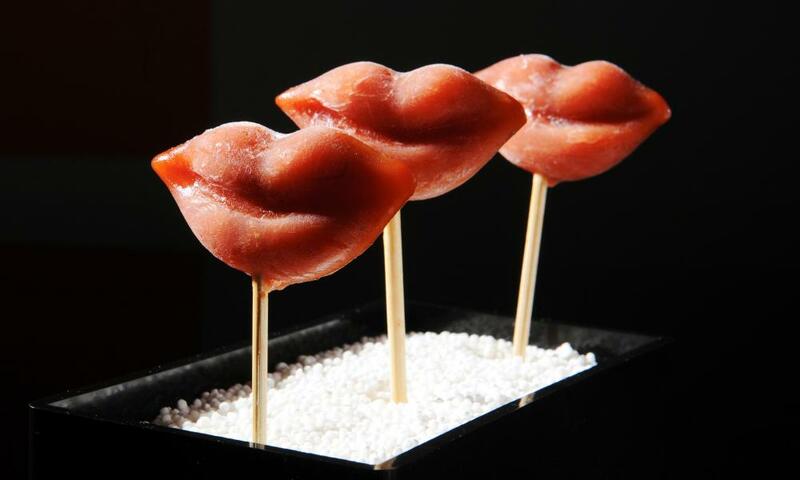 The lips themselves are made from a virgin mary recipe and set into a sorbet texture, then frozen in lip-shaped moulds. These handmade boozy sweets come in flavours from spiced rum to whisky sour and are all chewy fizz and jammy fruitiness, although don’t do as I did and guzzle a couple just before you pick the kids up from school. Booze is booze, even if it does come looking like a gummy bear: each pastille is 6% alcohol. Smith & Sinclair are past masters at creating alcoholic sweets, and have created all manner of delights, including cocktail bubbles, lollipops, sherbert, even alcoholic postage stamps. From 16 November until Christmas, you can sample their wares at the Benefits Cosmetics store on Carnaby Street, London. Finally, how can we not mention Heston’s Nitro-Poached Aperitifs, in G&T, Campari soda and vodka lime sour, those saucy smart bombs of Fat Duck lore, which look like meringues but explode in your mouth? Well, yes, of course they do. As the door has barely opened on the Fat Duck, one can only speculate at what hijinks lie within, but, as his PR gnomically said to me: “He does something interesting with pina colada”, I’m guessing there are some inventive tipples just dying to mess with your mind. So, do you like to chomp on a cocktail, or should they be kept purely in liquid form?